Move over Hamptons — there’s a new second-home hotbed for New Yorkers: the Catskills. 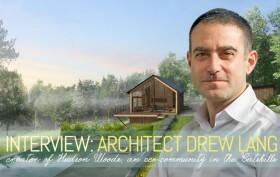 The four-season destination has been growing in popularity over the past several years, but is now reaching new heights thanks to Drew Lang and Lang Architecture‘s forest getaway community Hudson Woods. Located in Kerhonkson, New York, just two hours from New York City, the 131-acre development will feature 26 sustainably designed, site-specific dwellings, each located on its own spacious lot. Buyers can personalize their homes with curated upgrades including a pool and pool house, outdoor kitchen, vegetable garden, fruit tree grove, treehouse, and solar power energy system, among other things. Hudson Woods’ tagline is “where design meets nature,” and one look at the site makes this statement ring true. We sat down with Drew Lang to get an inside take on the project, and to learn more about the increasingly sought after Catskills community.